“It’s beginning to look a lot like sale season!” As crazy as it may have been to see Halloween decorations and even Christmas lights lining the aisles of Target in July, planning and starting sales a little early is a good idea. A study done by the National Retail Federation found that 40% of people shopping for holiday gifts start before Halloween, but an equal amount of shoppers start in November (woocommerce). But fall sales are also a great way to test your bestsellers, worstsellers, and to help you figure out what social media strategies work out best for you and your brand before that holiday rush. Here are a few ideas for fall sales to run to get you brainstorming! There are a few different ways you can give your customers sweet, sweet deals. Free shipping: With Artist Shops, we will once in a while have a free shipping code for you to offer your customers – take advantage of it while it’s out. Lower the price of select items: Hoodies, long sleeves, and zip-ups are great styles to discount for the colder months or tanks and tees for last-call-for-summer-months sales. Lowering the price of EVERYTHING: You can do this, but also make sure to tap into relevant holidays/events and to theme your sales in a way that will strike a chord with your niche. Use the global pricing tool in your Dashboard to do this super quick and across the pricing board! Offering limited edition items: This creates urgency and is a good way of testing out new designs. Utilizing email announcements and social media is also a great way of keeping your customers updated with deals, discounts, and new products. And with Threadless Artist Shops, your shop has a “Follow” button that will send an email to customers who follow you when you add a new product. Be sure to add fall-relevant products to your Artist Shop! Artist Shops just added super soft sponge fleece pullover hoodies, zip-up hoodies, and sweatshirts (in addition to the pre-existing fleece) to the product lineup. Freshly adding these products (and maybe discounting them) is a great way to jump to the top of Discover at prime promo time, but is also a great way to appeal to those getting into the chilly weather mindset. Everyone expects holiday and pre-holiday sales. But there are a lot of opportunities to get clever with your sales during the fall. 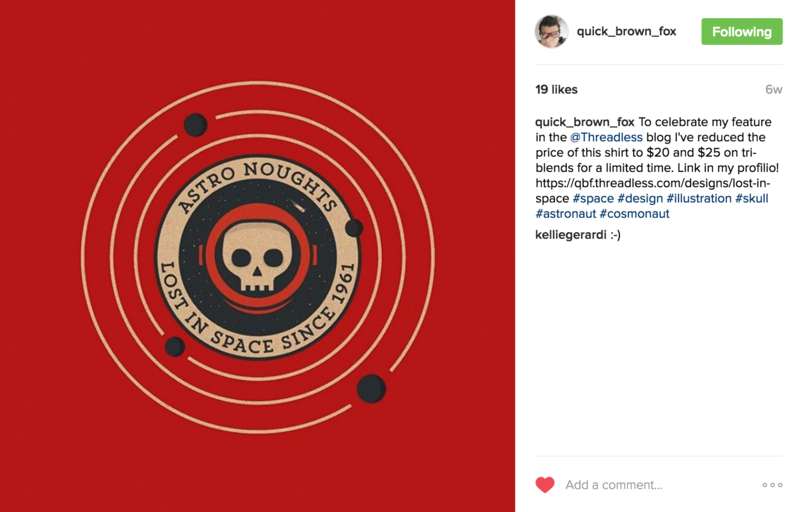 For example, when Threadless posted about one of John Tibbot’s (QuickBrownFox) Artist Shop, he lowered the price of that design in his shop to celebrate. But running successful and engaging sales takes a little more than just lowering the prices of all of your products. When you can tap into relevant holidays/events and theme your sales in a way that your niche will appreciate (even just for specific designs), that’s ideal. Here are just a few ideas to get you brainstorming some fall sales that are more than just “fall sales”! *Suggested time window: For “start of fall” sales, beginning of September to the first week of October. For “End of Summer” summer style sales, the beginning of September and last week of August. Tapping into your customers’ interests with themes they’ll appreciate is a great way to create customer loyalty as well as scoring sales. And there are a thousand ways you can do this with your shop. A few examples: recently, there was a full “Hunter’s Moon” – if your audience niche like creepy vibes, the cosmos, the moon cycle, etc., this is an example of a random event to benefit from. If you specialize in beer/brewery-related designs, consider doing an Oktoberfest sale. Have a geeky audience? Do a mini-discount on all of your geeky designs when there’s a new game coming out, or when there’s a big comic or video game convention going on. Have a big following of sports fans? Do a mini-sale if your favorite team wins, when there’s a big game, to get ready for Fantasy Football starting up, etc! Similarly, if your customer base is heavily localized to a specific country or city, look into holidays, events, and any seasonal differences (ex. is their winter your summer?) they have that they might appreciate you acknowledging and offering a discount for. Suggested times: Two weeks before Halloween is a good time to throw in a little discount so that people get their Halloween swag in plenty of time to wear it right before Halloween. If you have back stock to get rid of, a super post-Halloween sale to clear stock would be a good idea too. Suggested times: Early November is a great time to start this, which then leads into the natural sale times of Black Friday/Cyber Monday. Also a great way to tap into fall giving way to the freezing months…and of course, if your audience is more geeky or you specialize in Game of Thrones designs, this is a great way of tapping into your niche with a themed sale. This can also serve as an early-bird gift-buying sale. Suggested times: For early bird sales – start in early, early November. “Clutch time” holiday sales – two weeks before a big holiday (if you know (and are very sure of) how long it takes to ship something to your customers, you can do a “last chance to have it by the holiday” sale). There are two kinds of holiday shoppers – the ones who start their gift shopping in September, and the ones who buy their gifts a week before the big winter holidays start. Early bird sales are a great way to target customers who jump on the holiday gift-buying bandwagon early, while last-minute sales are a great way of giving a sigh of relief to those customers ordering in the nick of time. During these times, you can pinpoint which designs are slow-selling and maybe discount them to try to sell more (inc.)! And in the case of Artist Shops where you don’t have any back-stock to get rid of, consider doing a “get ’em before they’re gone!” sale on slow-sellers before maybe taking them out of your shop, just to get a final wave of possible sales with them. Always good “sale holidays” to take advantage of! *Suggested sale times based on Threadless’s sale schedule! These are just some sale brainstorms that you can jump on or use to get inspired by – it’s not to say you have to run constant sales. In fact, it’s better to pace them out to increase urgency. And most importantly, run sales that will appeal to your audience. Finally, be careful to make sure you budget your time and money for creating sales. If you have extra stock, do post-holiday sales with big discounts to see if you can get rid of that stock. But if you want to eliminate the hassle of paying for manufacturing and shipping your products and having extra stock, Threadless Artist Shops take care of all that for you! “How to Maximize Holiday Sales and Profits” – inc.
Don’t have a shop to fill with wall art? Start one now!. . . So how do I implement a coupon code in my shop? Coupon codes are coming but are taking awhile as it’s a bit more complicated. Expect limited codes first and then full control later on. How can we offer coupon codes or alter the price? I don’t see those options on the dashboard…? Looking forward to those coupon codes! Great article, thank you!